This post was originally published on my personal blog. For this post, I decided to talk about a Python script I wrote last year, which I am still using it very often nowadays. This was one of those moments that you have an idea and you get really excited about it but have no clue on whether that would work as you expect or not. I started basically with some knowledge of Python and knowing which API I was going to use to accomplish that idea. The goal was to implement a script with which I could fetch the lyrics for the song currently playing on Spotify. So, at first, I knew I was going to need something that would provide me with an interface I could use to connect that script with the Spotify service running on my computer. Also, as I was a loyal user of Genius.com I knew that they have a large public API I could get some help from. 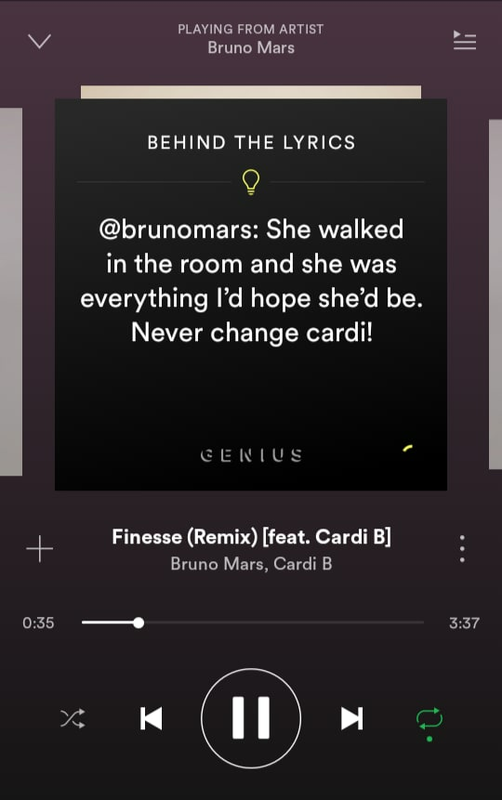 For the long-term Spotify users, you probably remember when Spotify had the functionality to show the song lyrics within the desktop app, right? Good old times. I still don't understand why that was removed but all we got now is the Behind the Lyrics feature, which shows some useless information and small snippets of the lyrics for the song we are listening (it seems it is available only on mobile devices). This was one of the things I had no clue how to do it so I had to do some googling to accomplish that. Luckily, this answer by jooon on Stackoverflow saved me a lot of time, so kudos to you sir. Basically, as I am a Linux user, the Spotify client I use automatically creates a D-Bus interface called MPRIS - Media Player Remote Interfacing Specification. From the D-Bus specifications page, the D-Bus API is commonly used to implement a service which will be consumed by multiple client programs. This kind of message system is designed for two specific cases: communication between desktop applications in the same desktop session and communication between the desktop session and the operating system, which includes any system processes (this is our case). A D-Bus system has several layers and one of them is formed by wrapper libraries, which is the kind of tool we are using here. 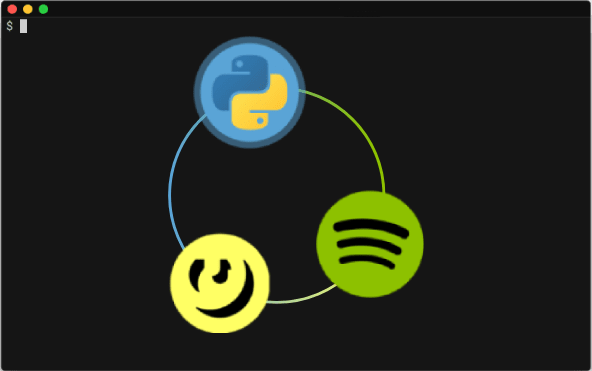 In order for the Python script to communicate with the Spotify desktop application, we will use the dbus-python wrapper library or technically called a binding for the libdbus library. After having that library installed in your system you can use the dbus module to create a SessionBus which we will use to communicate with Spotify. In the code above we a simply creating a SessionBus instance and using that to create an Interface with the Spotify application. From that connection, we can extract the metadata for that session, which will provide us with lots of info about the current Spotify session, including the name of the artist and song currently playing, which is what we need. Notice that this method returns a dictionary with two keys, artist and title. Since we already have the name of artist and song we want to search, we can go ahead and make a request to the Genius API. For that, we need an access token, which we can get by creating a Genius API client. First, we have to sign up for an account (or sign in if you already have an account on Genius). After that, you can go to the Genius API documentation page in order to manage your clients. The process to create a new client is pretty straightforward and after that, you will finally get your access token. Once you have your access token we can implement the next method. This method receives the song and artist name we extracted from the Spotify session and sends a request to the Genius API. Notice we are using the requests HTTP library to send a GET request. If everything works fine, you will have now a response object that contains tons of information about all the matches that were found in the API. Due to the object shape we got from the request, we will have to iterate over the hits key in that object and look for an exact match using the artist_name variable. If we successfully have a match in that object, it means that the song we look for is available in the API and is now available in the remote_song_info variable. Even though we have all of that information about a specific song, guess what, we do not have the LYRICS!! Exactly, the Genius API (as for the date this script was implemented) does not directly offer you the lyrics for a song. There is no endpoint to search for lyrics, as well. In order to bypass that situation, we would have to, in fact, crawl the web page in which that song is available. In the remote_song_info, you will have the URL for that song. From here we basically have to make our script access that page and crawl the lyrics for us. This method receives the song URL and uses the Beautiful Soup library to pull data from HTML files in an easier way. We finally have the lyrics to print out to the console. 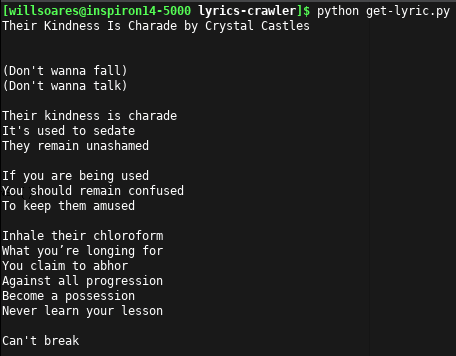 Tha cool thing is that during the crawling process each line in the lyrics automatically receives a new line escape sequence (\n). With that, we get a good looking structure in the terminal. All the methods mentioned in this post are available in this repository. The script should work with both Python 2.7 and Python 3. However, you should check which version you are using and which one you used to install the dependencies. Automatically have the song lyrics available in the lyric-view.txt file. Search for any song by passing the artist and song names (this mode does not interact with Spotify so there is no need to open it). Check the README.md. One last thing I would like to notice is that you don't always have to be inside the folder to get the lyrics, if you create an alias for that command in your .bashrc file. For me, I had to add this line to my .bashrc file. And also, I had to use an absolute path for the token.txt and lyric-view.txt files in the script code. With that, I can simply run the command lyric from any directory and get the lyrics for the song playing via Spotify. Hi i'm wondering one thing. 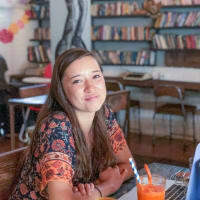 I'm new to coding so be nice. I downloaded the code from github, i'm testing it on a server, the genius token has been added. I managed to get beautiful soup and python downloaded for my server. When I use the command python3 get-lyric.py [changes] [2pac] I get told that the song (or any) cannot be found. I have not implemented the spotify side of the code. My understanding was i could test the genius part manually before plugging in the spotify part. What am I doing wrong? Thanks a bunch in advance! Yeah if you're passing the song and artist name it shoulnd't need to go through dbus stuff, so you'de be fine to just call Genius API. I'm wondering -- are you running the command with the square brackets around the artist and song name? BTW does Genius API expose the annotations? Hey, rhymes! I'm glad you liked. Nice stuff Will. Definitely going to read up on that D-Bus API, very useful stuff. Good work man. Thanks Emmanuel, I appreciate your feedback! In need of a band or song name? This is very cool but is there a way to do this without dbus? I've tried looking for running dbus on windows and it seems pretty unclear. This is a great alternative! Thanks for pointing it out! Learning to code products doesn't take as long as you think - more precisely, 300 hours to learn, build, and launch. Learn about the history and misconceptions of development preventing you from even starting and then hop on that tech bus. What is your REST API design / development / testing workflow? 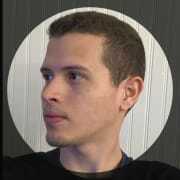 How I published/deployed my Python package to PYPI easily.